Last year was the Year of the Pig and I created a Piggy Butter Cookie. This year is the Year of the Rat and guess what I have created! Rat or rather Mouse-shaped Pineapple Tarts. However, this is strictly for education and training purposes. I will be demonstrating how to make this cookie for YMCA Festival of Love 2008 on 2nd February 2008. Food blogs: treats or threats? DO NOT buy food from online food blogs. The convenience of buying online isn't worth it when it comes to personal safety. The National Environment Agency (NEA) says the levels of hygiene maintained by blog sellers are "questionable". 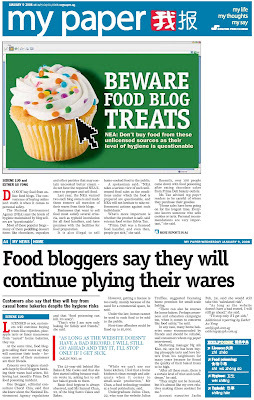 Most of these popular blogs - many of them peddling dessert items like chocolates, cupcakes and other pastries that may contain uncooked butter cream - do not have the required NEA licence to prepare and sell food. Last year, the NEA warned two such blog owners and made them remove all mention of their wares from their blogs. Businesses that want to sell food must satisfy several criteria, such as typhoid inoculation for all food handlers, and have premises with the facilities for food preparation. It is also illegal to sell home-cooked food to the public. A spokesman said: "NEA takes a serious view of such unlicenced food sales as the conditions under which the food is prepared are questionable, and NEA will not hesitate to take enforcement actions against such individuals." What's more important is whether the product is safe, said veteran food writer Sylvia Tan. "PrimaDeli was a licensed food handler, and even then, people got sick," she said. Recently, over 100 people came down with food poisoning after eating chocolate cakes from PrimaDeli bakery outlets. Ms Tan advised my paper readers to be careful of where they purchase their goodies. "Home sales have been going on for the longest time. Everyone knows someone who sells cookies or tarts. Personal recommendations are very important," she said. Licensed or not, customers will continue buying treats like cupcakes, pineapple tarts or fancy macaroons from "casual" home bakeries, they say. At the same time, food bloggers selling their wares say they will continue their trade - because most of their customers are their friends. Concern over hygiene standards kept by food bloggers hawking their wares had arisen, following last month's PrimaDeli food poisoning incident. One blogger, editorial consultant Cheryl Chia, said that she knew about the National Environment Agency regulations and that "food poisoning can kill, it's scary". "That's why I am now only baking for family and friends," she said. The 23-year-old behind She Bakes & She Cooks said that she first started selling because readers wrote in, asking her to sell her baked goods to them. Basic food hygiene is always observed, said Mr Samuel Chan, 22, of the blog Sam's Cakes and Bakes. However, getting a licence is too costly, mainly because of the need for a commercial space, he said. Under the law, homes cannot be used to cook food to be sold to the public. First-time offenders could be fined up to $1,000. "While we can't use our home kitchen, I feel that a home kitchen is clean enough and adequate when it comes to small-scale production," Mr Chan, a food technology student at a local polytechnic, said. Undergraduate Julius Chen, 22, who runs the website Julius Truffles, suggested licensing home premises for small-scale baking. "There can also be courses for home bakers. Perhaps awareness and education campaigns too, when it comes to concerns like food safety," he said. In any case, many home bakeries come recommended by friends and should be reliable, said consumers whom my paper interviewed. Marketing manager Ng Aik Kiat, 32, says he has been buying pineapple tarts and love letters from his neighbours for many years because he found the quality of their baked treats to be high. "After all these years, there is a certain level of trust and confidence," he said. "They might not be licensed, but it's almost like my own relatives making (these cookies) for me." Account executive Jaslin Poh, 28, said she would still take this "calculated risk". "As long as the website doesn't have a bad record, I will still go ahead," she said. "I'll stop only if I get sick." 2008 Chinese New Year Goodies! Chinese New Year is round the corner (about 1 month's time). This year, Sam has a wide range of cakes and goodies for you to choose from. Including the launch of Sugar-Free Cakes & Cookies. For more information, kindly email sam@sams-cakes.com for more details. Sam Wishes All a Happy New Year 2008! First and foremost, I would like to wish all my friends, customers, fellow blogger and readers a very Happy New Year 2008! There are lots of things to look forward to this year! I will be graduating by the 1st of February 2008 with a Diploma in Chemical Process Technology (Food Technology) from Singapore Polytechnic and will be going full force in fufilling my passion. 1. 2008 commemorates Sam's Cakes & Bakes 5th Anniversary. Look forward to delicious bakes coming up in the months to come. 2. Sugar-Free Cakes and Goodies will be launch this coming Chinese New Year, do enquire for more details. 3. Baking & Culinary Courses by Sam will start running from February 2008. Do enquire for more details as well. 4. More bake journal articles featuring new food finds and new food developments will be published. With so much plans in the pipeline, do constantly visit Sam's Bake Journal at http://samsbakejournal.blogspot.com/ for your daily reads and should you feel hungry for cakes & bakes or need to get that special customised gift for that special someone, visit http://www.sams-cakes.com/. Sam's Cakes & Bakes - Baked with Love & Sincerity. Baking & Culinary Courses at Sam's - Growing the Passion in You. Sam's Bake Journal - The Science of Baking Revealed.